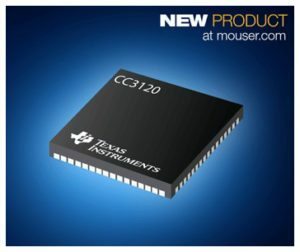 Mouser Electronics, Inc., is now stocking the CC3120 SimpleLink™ Wi-Fi network processor from Texas Instruments (TI). Part of TI’s SimpleLink microcontroller platform, the CC3120 Wi-Fi Internet-on-a chip™ device is comprised of a wireless network processor and power management subsystems, featuring a dedicated ARM® Cortex®-M3 microcontroller. The device allows for optimal network flexibility and maximum connectivity for Internet of Things (IoT) solutions for a multitude of microcontroller applications. The TI CC3120 SimpleLink Wi-Fi network processor, available from Mouser Electronics, allows designers to run Wi-Fi and Internet protocols implemented in the ROM, which in turn runs its dedicated on-chip ARM Cortex-M3 network processor to significantly offload the host microcontroller and simplify system integration. The on-chip microcontroller helps to completely offload Wi-Fi and Internet protocols from the application microcontroller, handling all the details of Wi-Fi connectivity — including identity, data and code security — without requiring any host processor resources. To simplify the integration and development of networking applications, the CC3120 is supplied with a slim and user-friendly host driver that can be easily ported to most platforms and operating systems. This flexibility essentially enables a designer to connect to just about any microcontroller to the IoT cloud using the CC3120.